Who doesn’t revel in the joy of playing golf in Portugal? As our Aer Lingus plane banked and began its approach over the Ria Formosa Natural Park, which separates the coast from the sea, every golfer on board peered out a window, straining to see a flag, a green, a golf course. 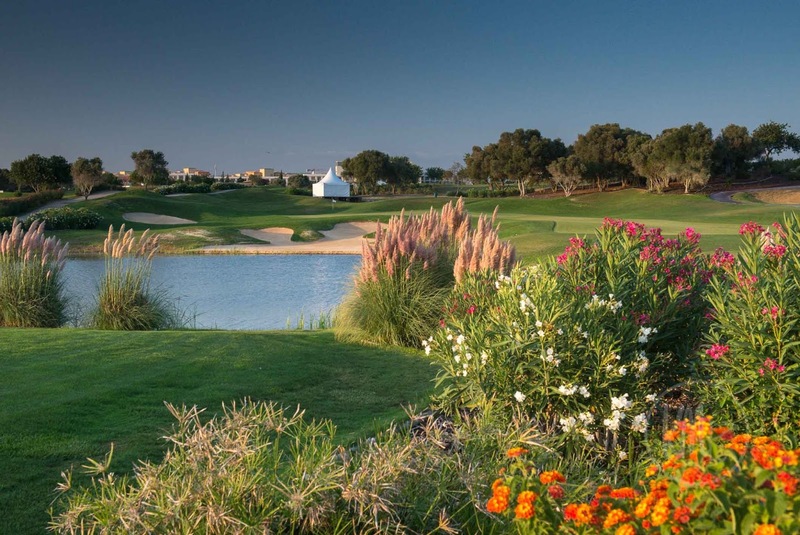 That is one of the joys of the Algarve: there are close to 40 golf courses along this southern stretch of Portugal and there’s a whopping great conglomerate of them not far from Faro. 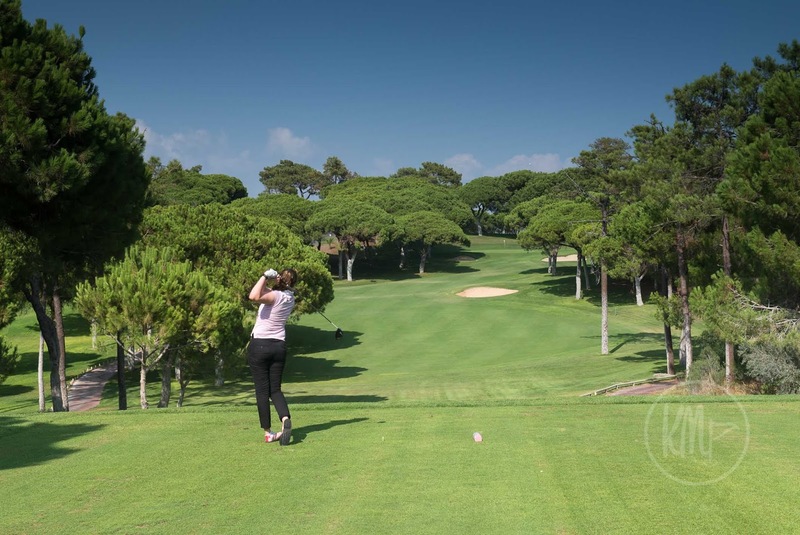 each other and three four star hotels which provide the perfect base… not just for golf but for bars, restaurants, nightlife and a casino that give Vilamoura its electric buzz. Our trip was to play the Victoria course, where this week’s Portugal Masters will be contested, but we also sneaked in rounds at two of Dom Pedro’s other courses: the enigmatic, split personality Millenium, and the adorable grand dame Vilamoura Old course. We were being spoilt, that’s for sure. 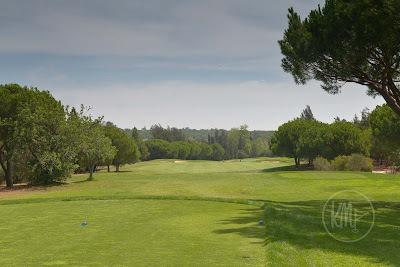 The 1st hole at Vilamoura Old. Not long after landing we were on the outside deck of the Old course’s clubhouse. Lunch, beer, views over the putting green to the 1st tee and a calming 26 degrees soaking through our clothes and into our skin. It had been a 4am start but that had long since been forgotten, especially with a 30 minute kip on the Aer Lingus flight. I thought I had played here 25 years ago, but the 1st hole made it abundantly clear that I was wrong. You wouldn’t, you couldn’t forget a hole like this. What a peach to start, driving down through umbrella pines (see below pic) that wander into your path and make that opening drive a strategic challenge when it comes to club selection. 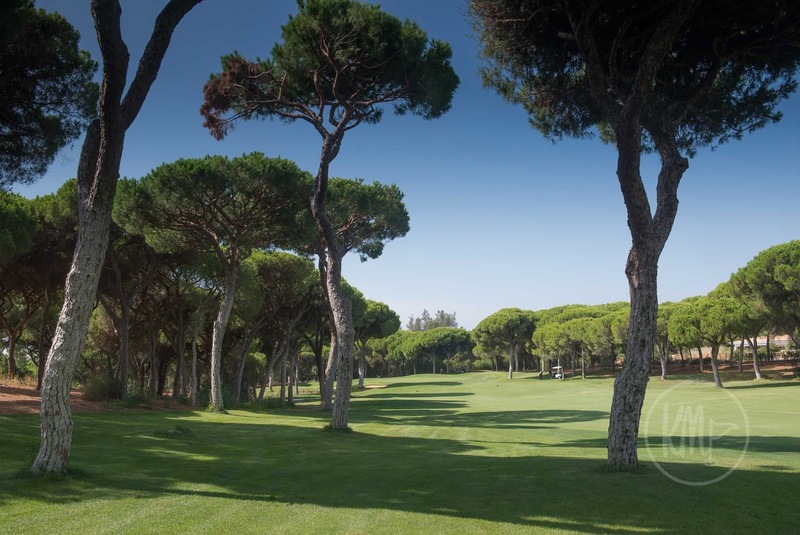 The short and sweet (and tricky) par four 9th at Vilamoura Old. This is a beautiful, lazy course that hides a lot more of those strategic challenges than you first imagine. There are some testing short holes (1, 9 and 13), excellent par threes and reachable par fives. You can’t help but be captivated by it all. I know that sometimes the little things make all the difference on these types of golf breaks. Maybe it’s a hole, or a birdie or exceptional customer service, or a night on the town… or, in my case, a glass of orange juice that had only been squeezed that day. Breakfast at the Vilamoura Dom Pedro hotel boasted so much choice it was hard to pick what to eat… but the orange juice just made it for me. I know that Portugal grows a lot of oranges (when I was here 25 years ago my friend stopped the car, leaned out the window and picked one from a tree) but let’s just say a fresh glass of orange ensures a fresh start to the day. One of my companions became rather attached to the pasteis de nata,or Portuguese custard tart, and we all enjoyed the Portuguese beer. The seafood is also excellent and while Vilamoura is one of the Algarve’s more expensive areas, prices are still lower that what you pay at home. It wouldn’t be right not to mention my room in the Vilamoura hotel. I was on the ninth floor with a balcony overlooking… well, look at the video below. I’ll also point out that the air conditioning worked perfectly. 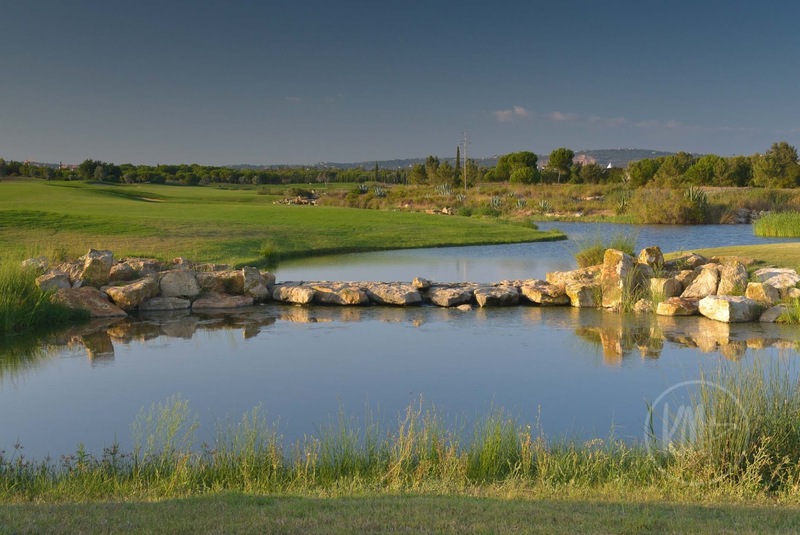 Day two saw us playing the Victoria course, home of the Portugal Masters and a very different beast to the Old course. The Victoria was designed by Arnold Palmer and has a modern and big feel. 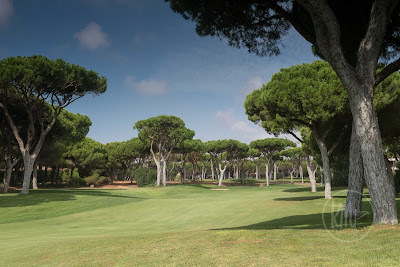 Far more open that the Old, the umbrella pines are replaced by olive trees (some were being harvested as we played) and the light – sometimes non-existent – rough of the Old was replaced by Bermuda grass rough that proved very tough to escape from. The par five 17th on Victoria - wet all the way. I’d asked for a locker when I registered in the Pro shop and I was given a key that only opened one… and it was José María Olazábal’s. That’s quite a thrill but after a decent round on the Old course, Victoria gave me a battering. 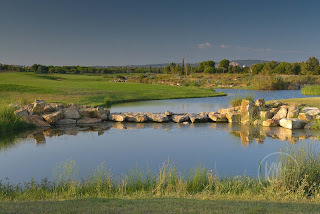 José María would have been ashamed and even though I only lost one ball, to the water on the famous 12th, the wayward tee shots led to so much punishment I didn’t manage 20 points. At least the late evening light made up for the poor golf as I headed out with YouTuber Harry Flower to shoot some photographs and video. The photo below is the par three 13th. If you check out Harry's YouTube channel you'll find a video of his entire Dom Pedro trip. After the golf we spent the evening in the Buzios Beach Club Restaurant, which, as its name suggests, is on the beach and only a five minute walk from the hotel. The food and the company were excellent and while the beach sat in quiet darkness it was clear that this was where people came to walk their dogs at night. Our final round was at the Millenium course. 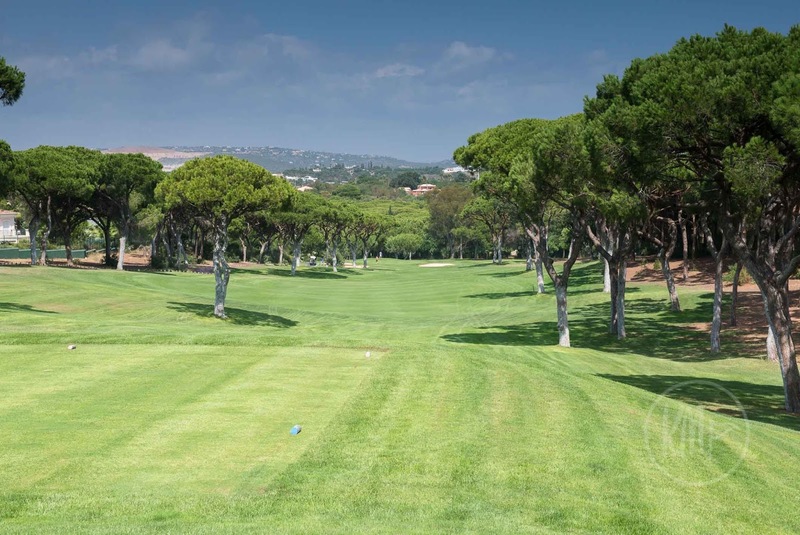 It lies on the opposite side of the road to the Victoria course and shares a clubhouse with Dom Pedro's Laguna course. Indeed, their Pro shops face each other across the corridor, almost identical but for the logo on shirts, caps and all the rest. The more open back nine at Millenium still bring plenty of trees into play. ... and that is true of Dome Pedro and its five courses and three hotels. 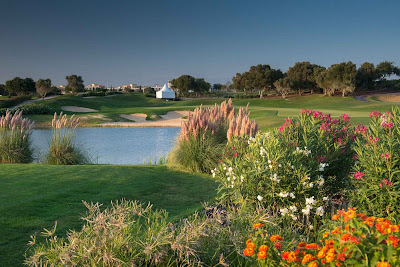 The resort does its own packages, if you want to book directly - although the usual tour operator deals are also available - or you can choose to play in a more competitive setting with the 21 Dom Pedro International Golf Classic, which takes place in January 2019.